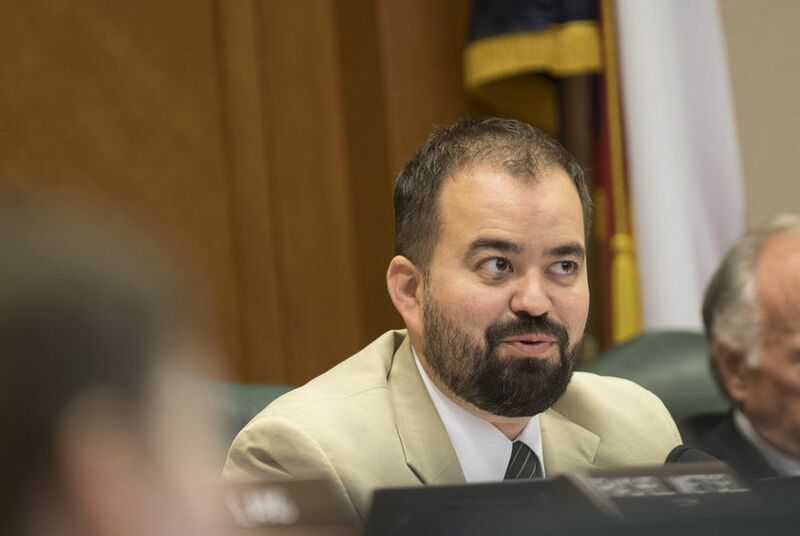 To close out This is Our Texas' month-long discussion about criminal justice, we did a Q&A with the Democratic chair of the House Criminal Jurisprudence Committee. In recent months, some big movers in Texas politics have called for big changes to the criminal justice system in Texas. This summer, Republican Gov. Greg Abbott proposed revamping the bail system — a mechanism used to ensure criminal defendants show up to their court hearings. A couple months prior at the GOP state convention, Republicans made news when they approved, for the first time, a plank in the party's platform supporting "a change in the law to make it a civil, and not a criminal, offense for legal adults only to possess one ounce or less of marijuana for personal use." Members of our Facebook group This Is Your Texas spent last month discussing criminal justice issues. And we invited state Rep. Joe Moody, D-El Paso, who chairs the House Criminal Jurisprudence Committee, to join us to talk about those issues and more that might come up in the next legislative session. Moody filed a marijuana civil penalties bill last session, but it didn't pass. Now, he says he's more confident. “That certainly does give me a greater sense of hope heading into 2019,” Moody previously told The Texas Tribune. Here's an excerpt from that Facebook conversation. Many of the questions below are crowdsourced from members of the group. Is there a budget for programs to get Texas prison inmates educated, trained for jobs, mental health treatment and counseling? If so, does it apply equally to women's prisons as well as men's? State Rep. Joe Moody: Let's start with the disconnect between men's and women's programming. It's absolutely true that there are fewer programs for women than for men. My understanding is that — by way of explanation, not justification — that's because there have historically been far, far more men in prison than women. However, we're now seeing a surge in incarcerated women, and I think it's incumbent on our state to provide equal opportunity for the women we lock up. More broadly, we have roughly 70,000 people per year who come out of our prisons. Obviously, we want to get that number way, way down by sending fewer people there. However, for those we do lock up, we need to do better, because that's a lot of folks. We do have educational and vocational programs within our prisons, but it's unclear whether those programs are consistently preparing inmates for the real world — are they getting usable academic credit or marketable skills? We commissioned a study on these issues last session, so I'm eager to get that report and see where we can improve. We should also strengthen individualized treatment plans as part of the parole or release process; although we set up that system in recent years, it hasn't been utilized nearly as effectively as it could be. What are the big issues facing legislators this year? What is your goal on reform? Moody: Drug penalties and the opioid abuse epidemic, the death penalty (particularly with regard to serious mental illness and intellectual and developmental disabilities), sexual assault reform and extreme risk protective orders (e.g. “red flag” laws) are going to be significant issues. Bail bond reform may be the single biggest standalone issue, especially after the recent cash bail repeal in California — we know that Texas always quickly follows California's lead. How likely is any sort of bail reform? How much is it under state control? Moody: It's 100 percent under state control unless we're dealing with federal holds, such as immigration detainers. It's a big issue with passionate views on both sides, and historically, big issues don't fly through in a session or two. That said, there's a lot of momentum and some litigation pending, so that might light a fire. Will you be introducing your civil penalty bill again? Moody: Yes, civil penalties will be the first bill I file this coming session. It's something that's becoming more and more likely as it becomes more and more bipartisan. From day one, I've said it was an issue both parties can support, and now we're seeing that in action. I'm optimistic. What impact would the legalization of marijuana have on the projected prison population? Moody: Legalization isn't something I've proposed — although I would probably support it — and not something I think has a chance of passing. Decriminalization in lieu of a civil penalty, however, would save us over $700 million a year. While it wouldn't impact prison populations, it would decrease local costs by freeing space in county jails. Do you foresee any legislation related to the death penalty in terms of what drugs and/or methods are used? Moody: While there has been significant concern about that, the broader issues are what I expect to get the most attention this coming session. Right now, we're talking about whether we should even have the death penalty, and if so, what classes of offenders it should apply to.